So, you’d think that combining a positive number and a negative number would be a fairly straightforward thing, huh? Well, unfortunately, a lot of students think it’s easy. They think it’s too easy. They think there’s one simple rule that guides them to the very same kind of answer every time. And that’s exactly where they get into trouble. The truth is that combining a positive and a negative number is a fairly complicated operation, and the sign of the answer is dependent on a nmber of factors. This video reveals a common mistake students make when tackling these problems. it also shows the correct way to approach these problems, using the analogy of having money and owing money to make everything make sense. So take a look and see if this explanation doesn’t end the confusion once and for all. And don’t forget: there are practice problems at the end of the video. Do those to make sure you’ve grasped the concept. This video gets to the root of this common misunderstanding by helping students understand exactly when two negatives make a positive, and when they don’t. Make sure you watch the whole video, as there are practice problems at the end, along with their answers. OK, teachers, homeschooling parents and tutors … raise your hand if you’ve ever felt uncomfortable when students pose that question about inequalities? That question being: why do we flip the inequality symbol when we multiply or divide by a negative number? I’d have to, sheepishly, raise my hand. So when I got asked that question once again last week, I decided to figure it out and come up with an answer that would help students understand this point. What I came up with is that it’s easiest to explain this through a combination of examples and logic. First, the examples. Let’s break the situation up into three cases. We could have inequalities in which the numbers on the two sides are A) both positive, B) both negative, or C) one number positive, the other negative. Now, multiply both sides by a positive number (let’s use 3), and we get: 6 < 12. Still true, right? Case B. Now let’s start with two negative numbers in our true inequality: – 4 < – 2 If we multiply both sides by a positive number (3 again), we get: – 12 < – 6, which is again true. But if we multiply this inequality by a negative number (– 3 again), we get: 12 < 6, which is obviously false. However if we once again flip the sign, we get a true statement: 12 > 6. Finally, Case C. Now we start with an inequality that has both a positive and a negative number: – 2 < 4. If we multiply both sides by positive 3, we get: – 6 < 12, which is still true. But if we multiply both sides by our – 3 again, we get: 6 < – 12, which is once again false. And again we need to flip the sign to make it true: 6 > – 12. So far so good, but this lacks the logic of an explanation. How can we bring in some logic and reasoning, to help students see why all of this stuff happens? Here’s my — granted, informal — way of explaining this. When we multiply or divide a number by positive numbers, we don’t change its sign; if the number was positive, it stays positive, and if it was negative, it stays negative. But when we multiply or divide a number by a negative number, we do change its sign … either from positive to negative, or from negative to positive. So the reason that we flip the inequality symbol must be related to the fact that — by multiplying or dividing both sides of the inequality by a negative number — we are changing the signs of both numbers in the inequality. But how exactly does this work? The answer, it turns out, is rooted in the relationship between the absolute value of numbers and their relative sizes. For numbers that are positive, there’s one way to tell which number is larger … the number with the larger absolute value is the larger number. For example, comparing 4 and 12, we know that 12 is larger than 4 because the absolute value of 12 is larger than the absolute value of 4. But for numbers that are negative, the exact opposite is true. For two negative numbers, the number with the larger absolute value is actually the smaller number. For example, compare – 4 and – 12. Their absolute values are 4 and 12, respectively, but the number with the larger absolute value is in fact the smaller number, not the larger number. In this example, – 12 (with the bigger absolute value of 12), is in fact smaller than – 4 (with the smaller absolute value of 4). So the point to remember here is that there are two different relationships between the absolute values of numbers and the relative sizes of numbers. For positive numbers, the greater the absolute value, the greater the number. But for negative numbers, the greater the absolute value, the smaller the number. This fact has an impact on inequalities where we change the signs of the numbers. Before changing the signs of the numbers, the numbers on the two sides of the inequality had one size relationship; one number was larger than the other (let’s say that Number A is, at this stage, larger than Number B). But when we multiply or divide both of these numbers by a negative, we flip the signs of both numbers. And by flipping the signs of both numbers, we change the size relationship of the numbers to each other. The one that was the larger one ends up being the smaller one, and vice-versa. So in our abstract example, if Number A was larger than Number B before their signs were changed, after both signs are changed, Number A will be smaller than Number B.
Josh Rappaport is the author of five books on math, including the Parents Choice-award winning Algebra Survival Guide. If you like how Josh explains these problems, you’ll certainly like the Algebra Survival Guide and companion Workbook, both of which are available on Amazon.com Just click the links in the sidebar for more information! If you or someone you know struggles when combining numbers with opposite signs — one positive, the other negative — this post is for you! To work out the answers, turn each problem into a math-story. In this case, turn it into the story of a tug-of-war battle. Here’s how. 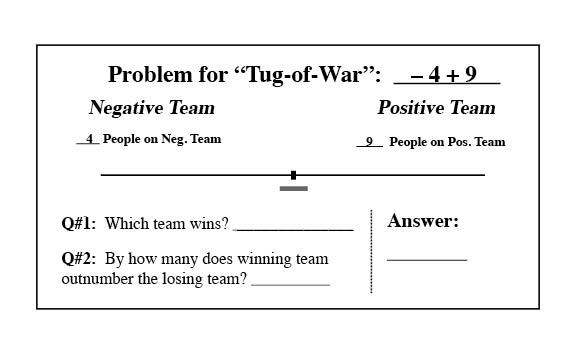 In the first problem, – 2 + 7, view the – 2 as meaning there are 2 people on the “negative” team; similarly, view the + 7 as meaning there are 7 people on the “positive” team. 1) Every “person” participating in the tug-of-war is equally strong. 2) The team with more people always wins; the team with fewer people always loses. 3) In the story we figure out by how many people the winning team “outnumbers” the other team. That’s simple; it just means how many more people are on that team than are on the other team. 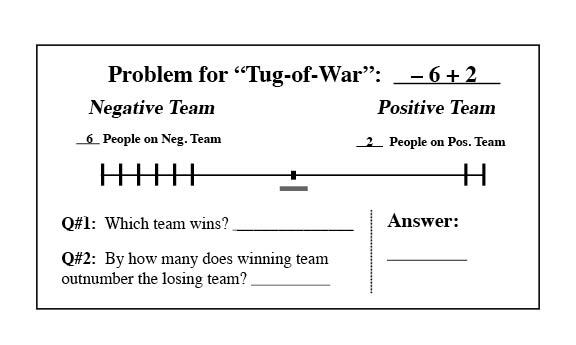 Example: if the negative team has 2 people and the positive team has 7 people, we say the positive team “outnumbers” the negative team by 5 people, since 7 is 5 more than 2. 1) How many people are on each team? 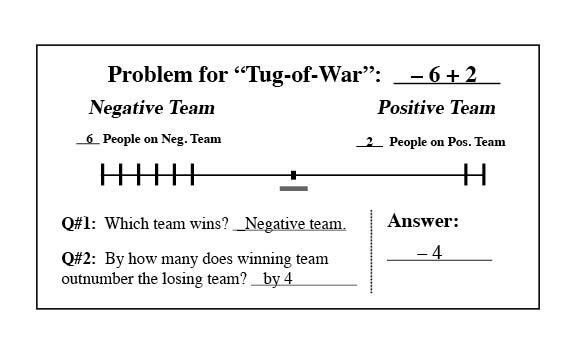 In our first problem, – 2 + 7, there are 2 people on the negative team and 7 people on the positive team. Since there are more people on the positive team, the positive team wins. 3) By how many people does the winning team OUTNUMBER the losing team? Since the positives have 7 while the negatives have only 2, the positives outnumber the negatives by 5. Now ignore the answer to the intro question, Question 1, but put together your answers to Questions 2 and 3. … THEY REALLY ARE THIS SIMPLE! But to believe this, it will help to work out one more problem: + 13 – 20. Here, again, are the common-sense questions, along with their answers. In this problem, + 13 – 20, there are 13 people on the positive team and 20 people on the negative team. 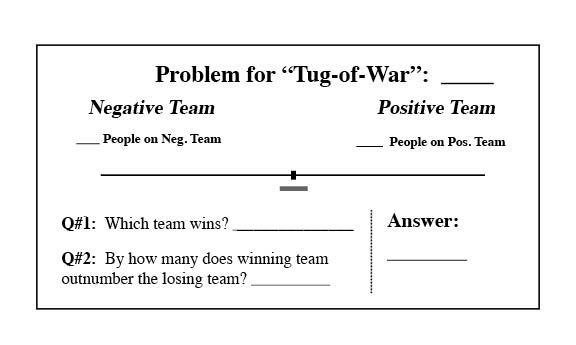 Since there are more people on the negative team in this problem, the negative team wins. Since the negatives have 20 while the positives have only 13, the negatives outnumber the positives by 7. Just as you did in the first problem, put together your answers to Questions 2 and 3. 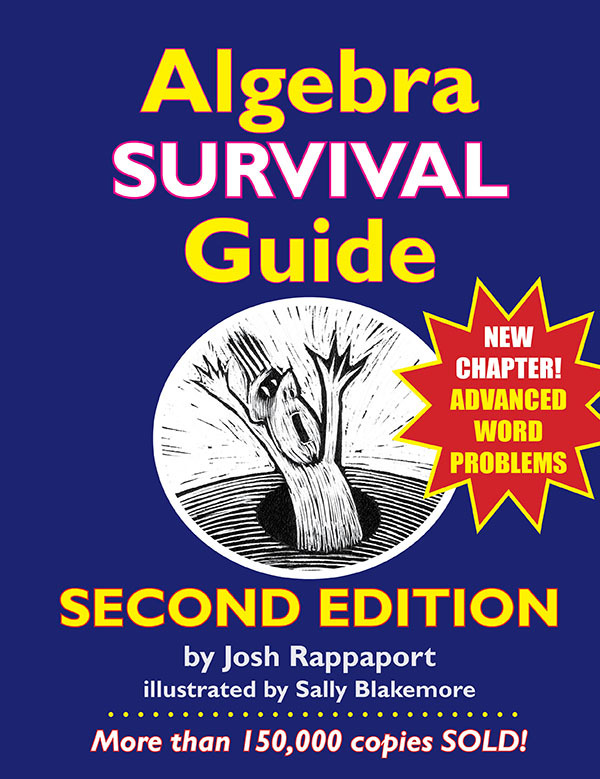 Josh Rappaport is the author of five books on math, including the Parents Choice-award winning Algebra Survival Guide. If you like the way Josh explains these problems, you will very likely like the Algebra Survival Guide and companion Workbook, both of which are available on Amazon.com Just click the links in the sidebar for more information! A reader named Michelle said she enjoyed my post on Memorizing the Times Tables. And then she asked if I have any tips on teaching students to SUBTRACT INTEGERS. It turns out that the answer is “yes,” and there are two places where I model this topic. The first is an excerpt from my Algebra Survival Guide, an excerpt about subtracting integers that you can check out now. I wrote an entire book on the topic of combining integers, PreAlgebra Blastoff! We created foam manipulatives to get across the idea of integers. There’s a piece of a foam with a hole in the center, the NEGATon, which stands for – 1. There’s a piece that fills the hole, the POSITon, and that manipulative stands for + 1. When you put the POSITon inside the NEGATon, you get 0, and that is a piece called a ZERObi. Using these manipuatives you can model and teach students how to combine integers, and add and subtract integers. Let me know if you have any questions on this topic. It’s certainly an important issue. Who says you can’t have fun with integers? For a number of years I’ve been using a fun story to explain the concept of combining integers with different signs. While I used to struggle at getting this concept across to certain kids, now, thanks to this story, there’s virtually no one who cannot grasp the concept when it is taught this way. I’d like to share it with you now so you can use it, too. The idea was first presented on p. 41 of my Algebra Survival Guide, along with a cartoon picture. The basic idea is that you can conceive of problems like: – 3 + 9, + 6 – 14, – 9 + 4, etc. as a tug-of-war. 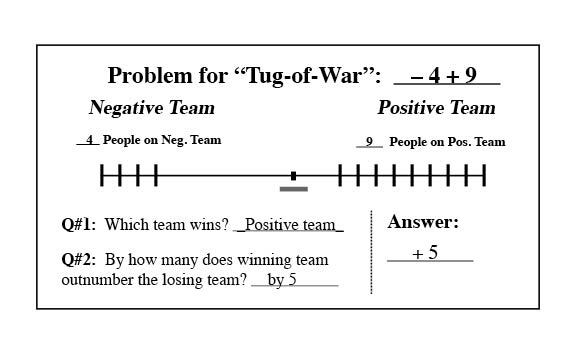 So … the “– 3” part tells us there are three people pulling on the negative team, while the “+ 9” part tells us there are nine people pulling on the positive team. When students put their answers together, they get the answer to the problem: + 6. Amazingly simple, huh? All it takes is looking at things in this fun new way. I’ve put together a little template that you can reproduce and use to teach this rule in this way. What follows is an example that shows in step-by-step fashion how students would input the data that leads them to the correct answer. Next students answer the two questions, right on the template. Finally students write in the answer, based on the answers to the questions. So that’s all there is to it. If you find anyone who cannot learn it this way, let me know. I’ll be amazed. I suggest using the template for a few days, and then, once students have the idea down cold, let them go off the template. The nice thing is that even after they go off the template, if they get a wrong answer, a really wrong answer, like: – 3 + 5 = – 8, you can ask them to think this out as a tug-of-war, and they will virtually always get it right at that point. Cool, huh? 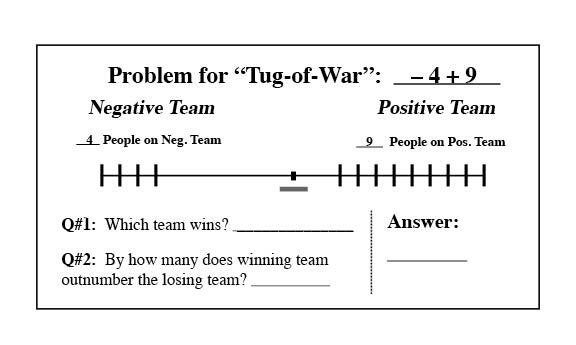 In a case where there are equal numbers of people on the positive and negative teams, the answer will be zero. Example: – 4 + 4 = 0. In terms of the tug-of-war, you might say this is a situation where neither team wins, and it ends as a tie. So a tie in the real world is a bit like 0 in the math world. Feel free to leave comments on the blog on how well this works for you in your teaching. And finally, if you don’t yet have my Algebra Survival Guide, it is loaded with analogies and metaphors just like this one. Teachers, parents, homeschoolers all enjoy and use this book. You’ll find that the Algebra Survival Guide has 173 Amazon customer reviews, with a 4.5 star rating! Algebra mistakes due to Negative Signs? Use COLOR to EXPLAIN. The key, I’ve found, is to use the Order of Operations to decode the meaning of each expression. Ask your students to think through how many Order of Operation steps there are in each expression. As for the bottom expression, this is more difficult because of that “loose” negative sign, a negative sign that is not enclosed inside parentheses. Just like a “loose canon” can be a danger in the military, a “loose” negative sign can spell trouble on the algebra playing-field. Students will make all kinds of weird mistakes in trying to figure out what to do with this little varmint. But if you tell students to view that “loose” negative sign as meaning (– 1) times the expression that follows it, they can use the Order of Operations again to do the right thing first. Specifically, they notice that there are two operations to be performed: multiplication and exponents, and they remember that they do exponents before multiplication, following the Order of Operations. I’ve yet to meet a student who cannot follow this procedure, when color is used. Try it out and see what kind of results you get.